We all know the basics of the food chain: plants eat sunlight, animals eat plants, and bigger animals eat smaller animals. In the world of nature, though, there are always exceptions, as witness plants that attract, trap and digest animals (mostly insects, but also the occasional snail, lizard, or even small mammal). On the following images, you'll meet 12 famous carnivorous plants, ranging from the familiar Venus flytrap to the less well-known cobra lily. The main thing that distinguishes the tropical pitcher plant, genus Nepenthes, from other carnivorous vegetables is its scale: the "pitchers" of this plant can reach over a foot in height, ideal for capturing and digesting not only insects, but small lizards, amphibians, and even mammals. The doomed animals are attracted by the plant's sweet scent, and once they fall into the pitcher digestion can take as long as two months! There are about 150 Nepenthes species scattered around the eastern hemisphere; the pitchers of some are used as drinking cups by monkeys (which are too large to find themselves on the wrong end of the food chain). So named because it looks like a cobra about to strike, the cobra lily, Darlingtonia californica, is a rare plant native to the cold-water bogs of Oregon and northern California. This plant is truly diabolical: not only does it lure insects into its pitcher with its sweet smell, but its closed pitchers have numerous, see-through false "exits" that exhaust its desperate victims as they try to escape. Oddly enough, naturalists have yet to identify the natural pollinator of the cobra lily; clearly, some type of insect gathers this flower's pollen and lives to see another day, but it's unknown precisely which. Despite its aggressive-sounding name, it's unclear if the trigger plant (genus Stylidium) is genuinely carnivorous, or simply trying to protect itself from pesky insects. Some species of trigger plants are equipped with "trichomes," or sticky hairs, which capture small bugs that have nothing to do with the pollination process — and the leaves of these plants secrete digestive enzymes that slowly dissolve their unfortunate victims. Pending further research, though, we don't know if trigger plants actually derive any nutrition from their small, wriggling prey, or are simply dispensing with unwanted visitors. A species of plant known as a liana, Tryphiophyllum peltatum has more stages in its life cycle than Ridley Scott's alien. 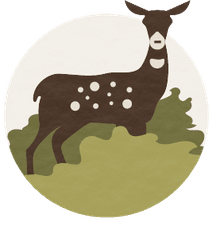 First, it grows unremarkable-looking oval-shaped leaves; then, around the time it flowers, it produces long, sticky, "glandular" leaves that attract, capture, and digest insects. And lastly, it becomes a climbing vine equipped with short, hooked leaves, sometimes attaining lengths of over a hundred feet. If this sounds creepy, there's no need to worry: outside of greenhouses specializing in exotic plants, the only place you can encounter T. peltatum is in tropical west Africa. So called because its broad leaves look like they've been coated with butter, the butterwort (genus Pinguicula) is native to Eurasia and North, South and Central America. Rather than emitting a sweet smell, butterworts attract insects that mistake the pearly secretions on their leaves for water, at which point they get mired in the sticky goo and are slowly dissolved by digestive enzymes. You can often tell when a butterwort has had a good meal by the hollow insect exoskeletons, made out of chitin, left on its leaves after their insides have been sucked dry. Unlike the other plants on this list, the corkscrew plant (genus Genlisea) doesn't much care for insects; rather, its main diet consists of protozoans and other microscopic animals, which it attracts and eats using specialized leaves that grow under the soil. (These underground leaves are long, pale and rootlike, but Genlisea also has more normal-looking green leaves that sprout above ground and are used to photosynthesize light). Technically classified as herbs, corkscrew plants inhabit the semi-aquatic regions of Africa and Central and South America. The Venus flytrap is to other carnivorous plants what Tyrannosaurus Rex is to dinosaurs: maybe not the biggest, but certainly the most well-known member of its breed. Despite what you may have seen in the movies, the Venus flytrap is fairly small (this entire plant is no more than half a foot in length) and its sticky, eyelid-like "traps" are only about an inch long. 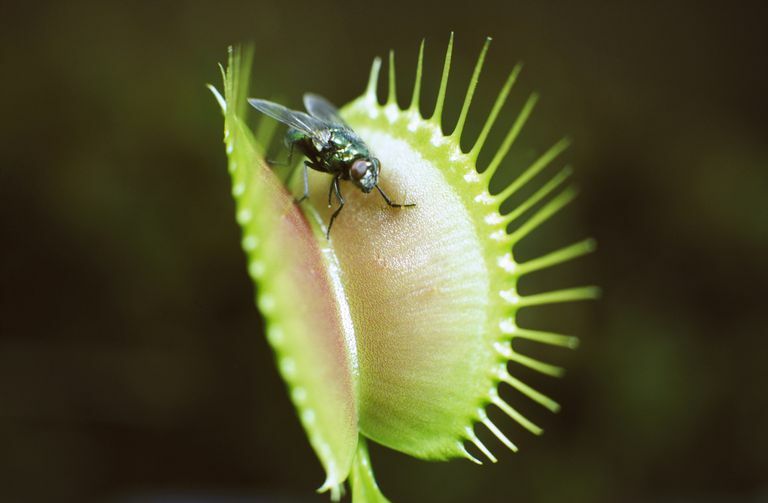 One interesting fact about the Venus flytrap: to cut down on false alarms from falling leaves and pieces of debris, this plant's traps will snap shut only if an insect touches two different interior hairs in the course of 20 seconds. For all intents and purposes, the aquatic version of the Venus flytrap, the waterwheel plant (Aldrovanda vesiculosa) has no roots, floating on the surface of lakes and enticing bugs with its small traps (five to nine apiece on symmetrical "whorls" that extend down this plant's length). Given the similarities in their eating habits and physiology — the traps of the waterwheel plant can snap shut in as little as one-one hundredth of a second — you may not be surprised to learn that A. vesiculosa and the Venus flytrap share a least one common ancestor, a carnivorous plant that lived sometime during the Cenozoic Era. The moccasin plant, genus Cephalotus, checks all the appropriate boxes for a meat-eating vegetable: it attracts insects with its sweet scent, and then lures them into its moccasin-shaped pitchers, where the unfortunate bug is slowly digested. (To further confuse prey, the lids of these pitchers have translucent cells, which cause insects to knock themselves silly trying to escape.) What makes the moccasin plant unusual is that it's more closely related to flowering plants (like apple trees and oak trees) than it is to other carnivorous pitcher plants, which can likely be chalked up to convergent evolution. Not quite a broccoli, though every bit as off-putting to people who don't care for carnivorous plants, Brocchinia reducta is actually a type of bromeliad, the same family of plants that includes pineapples, Spanish mosses, and various thick-leaved "succulents." Brocchinia is equipped with long, slender pitchers that reflect ultraviolet light (which insects are attracted to) and, like most of the other plants on this list, emits a sweet scent that's irresistible to the average bug. For a long time botanists were unsure if Brocchinia was a true carnivore, until the discovery in 2005 of digestive enzymes in its copious bell.